Aliens swarm at the top of the screen, swooping down on your spacecraft. Your craft begins with three segments, one deployed at a time. After the “insect” and “fireball” levels, you are able to attempt docking the segments together. A successful dock gives you more firepower for the upcoming levels. 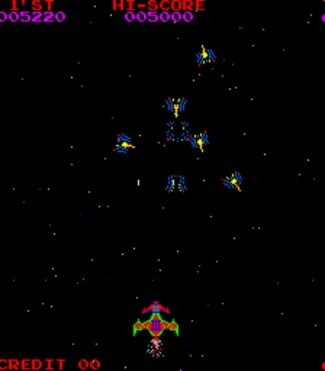 This was one of the earliest “multi level” shoot-em-ups, and the concept of the three docked ships remains pretty unique, and pre-dated Galaga. This was a very sophisticated game for its time. The key to this game is docking as quickly as possible – and never fail to dock. Also, once you have lost ships one and two, you are doomed. Ship three is huge, and easily hit. The real action is when ships two and three are docked – you can lose ship one and still do well at this game. Only the best players manage to keep ship one for any length of time. At 60,000 points you get a “replay” opportunity. After 60,000 points, once your last ship is destroyed (remember there are three ships which dock together”, you get the message “enjoy another game”, and you get a fresh stack of three ships. However, you continue to play at the same level, which by now is probably insanely fast! If your docked spaceship is hit, only the first of the docked ships to be hit is destroyed. If you manage to dock all three ships, you can fire five shots. If you then get killed by something crashing into the middle ship you end up with a small ship and a huge ship – which look strange when docked. You get more points for docking your ships quickly, and this can make a big difference to your chance of getting a replay (60000 points), which is actually very difficult. It is therefore smart to centre your ship as you kill the last of the aliens before each docking mission. Docking occurs after the second wave of “flies” and the fireballs. There are two waves of every type of alien, which differ in colour. It is really important to race to the right hand side of the screen after you have finished off the second wave of the aliens (called “four-D”) which look and sound bird-like. Straight after this wave, you are assaulted by fireballs which are hard to kill. You are in grave danger if you don’t hide on the right hand side of the screen for this wave, and only move inwards to fire well-aimed shots and then retreat again! The fireballs are the only things you don’t have to shoot to finish the wave, but they are worth the most points. The “four-d” aliens (which look and sound bird-like) can disappear and re-appear, but continue to move while they are invisible.